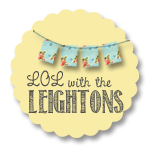 lol with the leightons: How Do I Love Thee, Etsy? Let me count the ways. I heart Etsy. It’s truly one of my very favorite things (yes, in addition to Better With You, reality TV, Twilight, and Dairy Queen Mini Blizzards – oh – and my Hubs). My first encounter with Etsy was early last year as I was preparing for our wedding. I purchased several ceremony accessories, and, because I had such good experiences, I’ve kept going back for more and more and more! I wanted to share a few of my fabulous finds and fixations (you can click on each of their names and it will take you right to their Etsy shop). 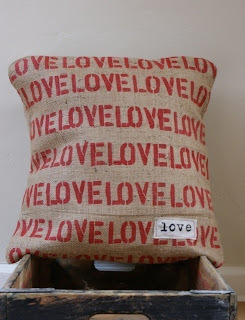 Tobey makes the most wonderful burlap pillows (in addition to many other goodies). I'm currently obsessed with burlap. It’s very chic and timeless. 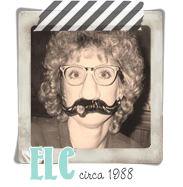 ELC is probably the one who got me initially hooked. She and Dad use old grain sacks for their Christmas tree skirt. They have for many years. I've purchased four pillows from Tobey (and I don’t plan on stopping any time soon). Each one is incredibly beautiful and unique. Two of them actually live at ELC’s house! One was a gift from me and Hubby. She loved it so much she asked if I would order her another one. The picture below is the latest pillow I am coveting. Isn’t it charming and lovely? Thank you, Tobey, for always being a jewel to work with. I first saw Diane’s artwork in a little store back home when I was visiting ELC and Dad one weekend. It was love at first sight. 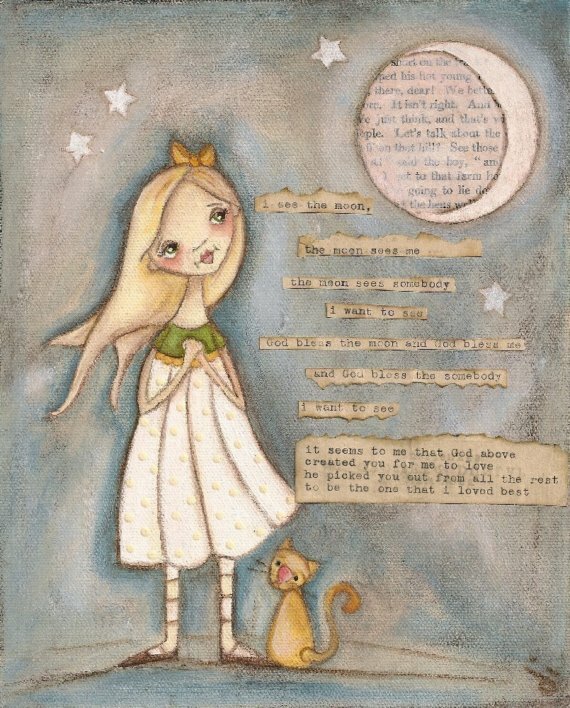 I instantly thought, “If I'm blessed with a baby girl someday, these prints must hang in her nursery.” You couldn’t imagine my excitement when I discovered she had a shop on Etsy (Thanks, ELC!). Dream come true! I immediately had to order six the following day (yes... SIX). The print below just might be my favorite, though it’s tres hard to choose. When I was little, ELC and I would look up at the moon and stars. I can remember it vividly. I think that’s why this holds such a special place in my heart. Diane is an amazingly gifted artist and has to be one of the kindest Etsy-ers. Thank you, Diane, for your generosity and sharing your talent with the world. I love throwing parties. I consider it a hobby. If I can’t be a country western singer or work at OPI when I grow up, I want to be a party planner. I think there are unlimited ways to add personality to any festive soiree. I also have quite the affinity for cupcakes. Mini cupcakes to be exact (mini foods equal mini calories – yep, that’s my logic). What happens when you mix mini cupcakes with a party that needs extra pizzazz? You get mini cupcake toppers! Colleen is a doll. She uses the prettiest paper. I contacted her after discovering her shop on Etsy. I needed toppers for a shower I was hosting. I asked her if she would create a "custom listing" since I needed some that would be the perfect size and fit for mini cupcakes. She never hesitated. They were brilliant and a huge hit! I adored them so much, we’re actually working together again on another baby shower. 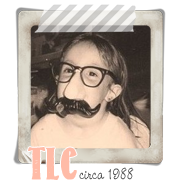 Thank you, Colleen, for being such an Etsy-Extraordinaire. You know I’ll keep coming back! I heart pictures. They capture memories, and memories are priceless. If you’ve been to my house, you know I collect picture frames (in addition to my many nail polishes). The one below is my new favorite frame. In fact, it holds one of my most cherished pictures from our wedding day (it’s a view of the ceremony from the back of the Chapel). Every time I look at that frame, I just smile. Two of my favorite girls gave me this gem last year (THANK Y’ALL SO MUCH, Sunny and Nelly!). Their daughter/sister-in-law is the talented gal behind these frames. I immediately had to order a few for Christmas gifts. I asked her if she could make them extra "Christmas-y." She did, and they were spectacular. Thank you, Tracey! You are a super woman. My darling hubby gave me a snazzy new DSLR camera for Christmas this year. I’ll need more frames for the pictures I plan on taking (once I figure out how to use it – LOL). Honestly, my Etsy list could be endless. It's a splendid addiction (maybe not so much for my wallet). I can’t wait for y'all to visit these shops and see all of the wonderful treasures. I have no doubt you will be instantly hooked! Ok I admit I've been trying to avoid Etsy I simply can NOT do it any longer. Your "LOVE" pillow is precious! I absolutely adore all of your other picks. After reading your post, I promptly visited all of those shops and swooned over their merchandise. Trying to resist purchasing, but I can't. I think I'm going to start with a pillow... so so cute!